As Chinese investors become increasingly concerned about the screening process adopted by the European Union, China’s ambassador to the bloc said it should avoid using practices that might be seen as discriminatory. “You know companies, capital, they’re very skittish,” Zhang Ming said in an interview at the Chinese embassy in Brussels. His comments came after the EU introduced new rules on the screening of foreign investment on April 1, in a move that some in Europe said was a response to years of Chinese investment in strategic sectors, like energy and hi-tech, across the continent. The new mechanism requires the sharing of information about non-EU investment in critical sectors and allows EU member states to question deals they might perceive to be detrimental to the bloc’s interests. Zhang said he would continue to press the EU on its investment screening process to ensure it respects market principles. 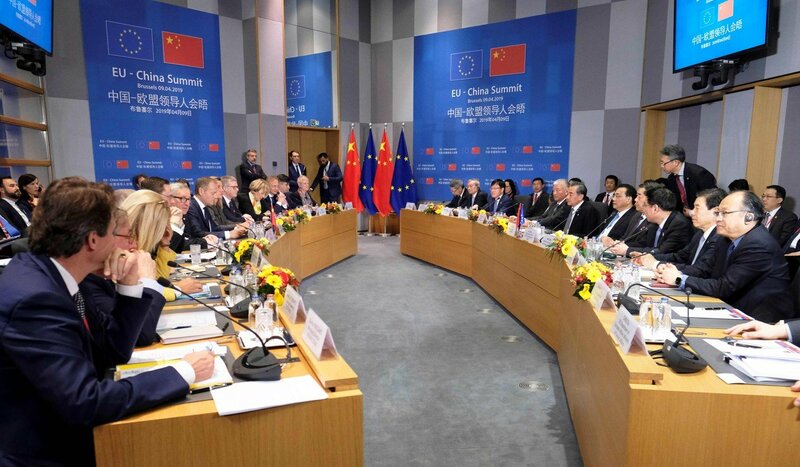 On Tuesday, the EU and China released a joint statement at the end of their annual summit in Brussels in which they outlined their commitment to continued cooperation. After some tense negotiations, the publication of the statement – which included pledges to finalise a long-awaited bilateral investment agreement before the end of next year and a commitment to greater openness towards foreign investment – was seen by many EU leaders as a breakthrough. “Negotiations have been difficult, but ultimately fruitful,” European Council President Donald Tusk said about the deal. Zhang said that although the summit had shown China-EU relations remained strong, he still had work to do to assuage the concerns of Chinese investors. European investment in China rose 25 per cent year on year in 2018 to US$10.4 billion, according to official Chinese figures. In contrast, Chinese investment in Europe fell 40 per cent in the same period, according to a study by the Mercator Institute. While investment screening was not the only reason for the dip, it was a cause for concern, Zhang said, which “is why we are watching it”. “Of course, investment screening is an internal matter for the EU,” he said. “I can’t make irresponsible remarks, but I hope the EU can remain open and welcome foreign investment, including Chinese investment, and at least not discriminate. Chinese Premier Li Keqiang, a co-signatory of the joint statement, said in his closing remarks at the summit that the two sides had committed to further opening up and pledged to avoid the use of discriminatory practices. He said also that he hoped the EU would remain impartial towards Chinese investors. Embattled technology giant Huawei and other Chinese firms have faced intense scrutiny in the EU and elsewhere over concerns China’s legislation – in particular the national intelligence law enacted in 2017 – compels them to engage in espionage. In the United States and Australia the use of Huawei equipment has been banned on security grounds, though the EU has yet to apply such a sweeping restriction. Despite the positive outcome of the EU-China summit, Brussels has hardened its stance towards Beijing in recent weeks. Last month, it referred to China as a “systemic rival” and reiterated calls for it to further open its markets to European firms and tackle what it called unfair state intervention in the economy. Against that backdrop, EU officials said just days before the summit that they would not endorse a joint statement with Beijing without commitments on state subsidies. Zhang said that while it was obvious the two sides did not see eye to eye on every issue, officials needed to “work hard and work smart” to overcome their differences. The release of the joint statement was evidence that cooperation was still the main thrust of the EU-China relationship, he said. Furthermore, it showed that the European Union was free from the influence of other major powers. “The successful outcome of the EU-China summit could not have come about without the independence of the EU,” he said.